I’m sitting with Mark Marczyk and Marichka Kudriavtseva. For the past twenty minutes or so I’ve asking the couple questions about their time on the Maidan, the site of the Ukrainian protests that turned violent early last year. In the aftermath of the protest Ukraine was invaded by Russian troops, and since that time the country has been at war over annexed territory. While media coverage has dwindled, Marczyk and Kudriavtseva stress to me that the struggle is still happening. People are still fighting. Later this week the couple – who met on the Maidan - will premier Counting Sheep at Toronto’s Summerworks Festival alongside their gypsy-punk band Lemon Bucket Orkestra. 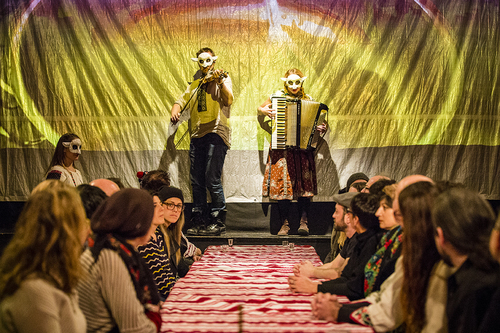 Counting Sheep is an interactive mixed-media performance that uses music, movement, found footage, and food to tell the story of revolutionary Kyiv. Marczyk and Kudriavtseva created the performance as a gateway to their experience as protesters. They wanted to share the intense joy and utter terror that they found on the square. Marcysk, a Canadian of Ukrainian heritage, was scoring a film near Kyiv during the protests over the government’s decision to bring the country closer to Russia. When Marcysk arrived on The Maidan – Kyiv’s centeral square - he found people of all walks of life, from all areas of the country, who had organized around the cause. The Maidan had turned into a functional tent city. People were sharing food, helping out with various chores, and protecting each other for the greater good of their country. Marcysk was floored by the sense of community and overwhelming warmth of the people. The same night he arrived the first of the protesters were killed. Marczyk and Kudriavtseva speak about their experiences in a calm and precise manor. Rather than scaring them away the first deaths on the square intensified their need to stay where they were. The two connected because both were writing about their experiences, blogging and sending out reports through news outlets and social media, and because in the wake of everything that happened they began to play music for people living on The Madian. Marczyk and Kudriavtseva stayed until the tent city was broken up and after that visited hospitals as well as battle sights to share their music and collect people’s stories. Counting Sheep is an effort to continue that work and bring those stories, as well as their own, to a wider audience. I caught an earlier incarnation of Counting Sheep earlier this year while doing coverage for Now Magazine. The performance – much like Marczyk and Kudiavtseva’s band Lemon Bucket Orkestra - isn’t the easiest thing to explain. It’s an experience more than a piece of theatre. The audience is invited to participate in the show, playing the part of the protesters as they slowly descent from celebration into sorrow. I left the theatre that night overwhelmed with mixture of emotions and feeling truly grateful for the chance to create and write like I do. The show offers a unique glimpse at people whose lives were turned political by circumstance and is a reminder of how quickly those things can be taken away. Dates for the show can be found here.